It is a week now since we said goodbye to my parents and they left on their long journey home to the Blue Mountains. We had a wonderful time with them and enjoyed some great outings and activities as well as thoroughly appreciating having them experience our daily lives with us. I hope I get a chance to write about a few of the things we did together but I am not making any promises as life continues to be busy here. 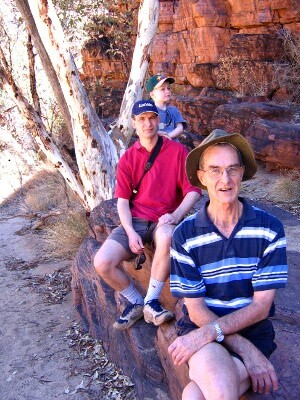 As I write this Andrew is in Australia, staying with his mother in Alice Springs. We received the very sad news on October 2nd that his dad had passed away. Andrew left the next day to be with his mum and will be there until the end of October. The last time we were with his family was in May 2005 whn all five of us visited Australia for a month. B9 was able to meet his Telford Grandparents for the first time. Below is a favourite photo of ours showing three generations of Telford men. B9 was only four at the time. Ken will be sadly missed by all of us. This entry was posted in Family on October 21, 2009 by Heather. So sorry to hear this news Heather. Thinking of you both, in different parts of the world. What a great photo and special memories it will bring in the future. My sympathies to your family. Have only just seen the news that A’s Dad had passed away. How difficult for you all, especially when you are so geographically far apart. Our sincere sympathy to you all.